Pennsylvania Gov. Tom Wolf speaks during a news conference at the Temple University Lewis Katz School of Medicine in Philadelphia, Thursday, June 2, 2016. Wolf recently told a group of Philadelphia area business people that DEP will approve permits for the controversial Mariner East 2 pipeline. Joe Minott, executive director of the Philadelphia-based Clean Air Council, thinks Wolf has potential, but he hasn’t lived up to it yet. Mark Szybist, of the the Natural Resources Defense Council, wants to see more leadership from the governor on clean energy. Environmental groups acknowledge Wolf faces stiff headwinds from the Republican-controlled legislature. The governor’s first year in office saw a historic, months-long stalemate over the state budget. Minott thinks that experience stuck with Wolf. “I think, generally, the governor is afraid of the legislature,” he said. For their part, Wolf staffers say they are working diligently in a tough political environment. For example, they point to a bill Wolf signed last fall, aimed at boosting solar power. He also pushed through a package of stronger regulations for Marcellus Shale gas drillers. He banned further leasing of state park and forest land for oil and gas development. Republican legislators, meanwhile, have been introducing bills aimed at limiting the executive branch’s ability to implement new regulations. Many have criticized the Wolf administration for overstepping its authority. That sentiment is echoed by David Hess, a former state Department of Environmental Protection Secretary under Republican Governor Tom Ridge. He now lobbies for the Pennsylvania Environmental Council, and says it’s harder to get good environmental policy done in the current political climate. Wolf irked many in the environmental community last summer when he backed a Senate bill that would have imposed a severance tax on the natural gas industry. It contained several provisions that would have altered the way the state Department of Environmental Protection functions. Although the bill ultimately did not advance in the House, it called for outsourcing the department’s permit reviews to third-party contractors. It also allowed for the automatic approval of certain oil and gas permits. The bill was criticized by former state environmental secretaries of both parties as unworkable and legally questionable. When it comes to the pressing global issue of climate change, many environmental advocates complain Wolf is on the sidelines. He made national news in 2016 when he announced plans for new methane controls for oil and gas sites. Methane is the main component of natural gas and is dozens of times more potent as a heat-trapping gas, compared to carbon. Two years later, though, his administration is finalizing permit requirements for new emission sources, but it has not yet proposed new regulations for existing oil and gas infrastructure. “It’s hard to take his public commitments to action on climate change seriously, when in his own state, he’s not actually taking real steps,” said Veronica Coptis, executive director of the Washington County-based Center for Coalfield Justice. The governor hasn’t followed through on a campaign pledge he made to join the Regional Greenhouse Gas Initiative. It’s a market-based program among northeastern states to reduce emissions. At a news conference Friday, Wolf denied ever pledging to join the initiative. Green groups have criticized Wolf for not joining the U.S. Climate Alliance, which is a bipartisan group of state governors pushing back against President Donald Trump’s decision to withdraw the U.S. from the Paris climate agreement. 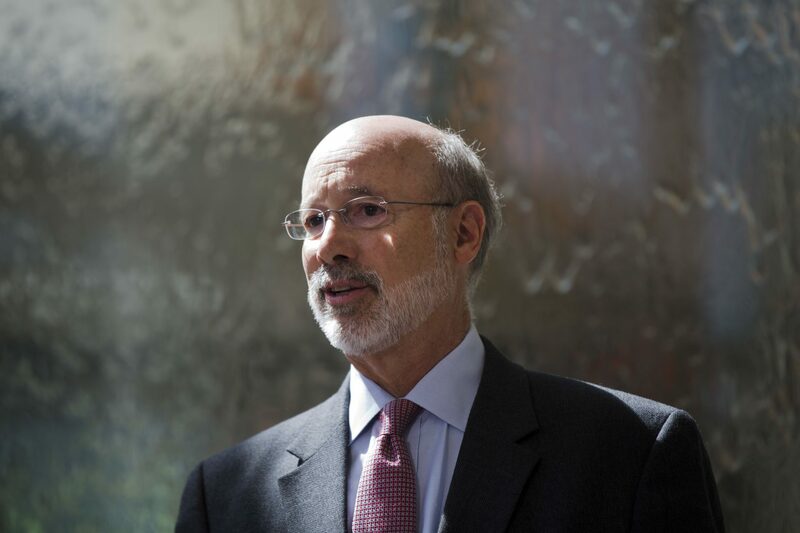 Wolf is one of three Democratic governors who has not joined. He’s dismissed it as a “symbolic gesture,” saying Pennsylvania is already on track to meet the Paris goals. It’s unlikely the legislature would support any effort Wolf made to cap carbon emissions, but environmentalists say his refusal to join the alliance is also symbolic. “He doesn’t seem to have taken a very strong public stance on climate change, which most people think is an existential threat to our very survival,” Minott said. Minott and others say they’re still hoping to see more concrete action on the environment from the governor later this year, or if he gets a second term.